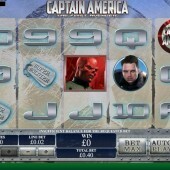 If you are a fan of the Marvel comics then you will undoubtedly be dying to play this Captain America slot by Playtech. It joins an established list of popular Marvel comics-inspired slots released by the online slot developer over recent years. This 5-reel, 20-payline effort features the superhero that came into being when an unfit and geeky Steve Rogers agreed to take part in a military experiment to develop a super-human. Rogers became Captain America: the First Avenger. The slot follows the storyline from the hit movie franchise of the same name including Captain America’s battle against Adolf Hitler’s head of weaponry in World War II, Red Skull. Both Captain America and Red Skull have symbols that represent a Wild during the game. You will receive a 2x multiplier to any wins triggered by these two Wild symbols completing winning combinations. The most exciting feature in Captain America is the Super Energy Free Games Bonus. This is triggered if you manage to hit the Captain America Wild on Reel 1, the Red Skull Wild on Reel 5 and the Free Games symbol on Reel 3. This is where the action comes into its own in this slot. You will immediately be awarded 4 free spins and you will be presented with 9 squares that you must select from. The various picks you make from the 9 squares could reward you with additional free spins up to 16 free spins, a multiplier value up to 3x on winnings during the free spins, a free spins re-trigger symbol in the form of a Cube symbol or an Expanding Captain America or Red Skull Wild symbol. There is also the possibility you will be rewarded with the 2 Super Spins if you select the right square. This will begin the Hero Super Spin and Villain Super Spin once the free spins have finished. In the Hero Super Spin, the Captain America Wild symbol acts as an Expanding Wild on the first reel with extra Wilds across the reels. In the Villain Super Spin the same rules apply except the Red Skull Wild replaces the Captain America Wild. Slot developer Playtech already has a hard earned reputation for producing some superb Marvel comics slots with the stunning Iron Man 3 slot and the exciting Fantastic Four slot just two examples of how well the developer transfers the franchises into the video slot format. 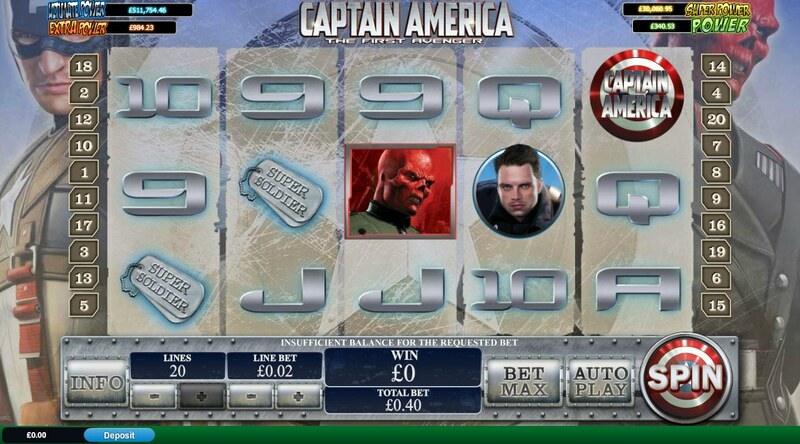 Captain America only enhances Playtech’s reputation for producing top class Marvel-themed slots. And with the recent spate of Captain America films at the cinema, expect this slot to run and run. Oh, and one last thing: don't forget that the game features the Marvel Mystery Jackpot - a progressive jackpot tied across all relevant Marvel slots in the Playtech casino armoury.